Join us in high summer at the Kickapoo Valley Reserve in LaFarge, WI for a day long conference all about medicinal plant conservation! 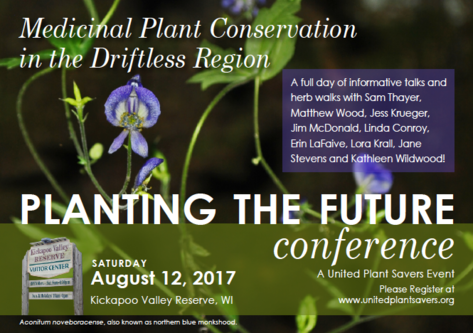 August 12th, 2017 join regional herbalists for this educational gathering in beautiful SW Wisconsin! Teachers include Linda Conroy, Matthew Wood, jim mcdonald, Jane Stevens. I will be teaching two classes; Harvesting & Preserving Medicinal Plants & Two Local Favorites: Bee Balm and Anise Hyssop. Thanks to the organizers and the Midwest Women’s Herbal Conference for sponsoring this conference.